"Mezze" redirects here. For the suburb of Damascus, see Mezzeh. This article is about the selection of dishes. For the canton in France, see Canton of Mèze. For the commune within the aforementioned canton, see Mèze. Meze or mezze (/ˈmɛzeɪ/) is a selection of small dishes served as appetizers in parts of the Middle East, the Balkans, Greece, and North Africa. In the Muslim regions where it is present, meze is often served as a part of multi-course meals, while in Greece and the Balkans they function more as snacks while drinking or talking. 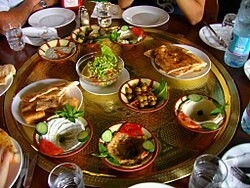 A large meze platter in Petra, Jordan. The word is found in all the cuisines of the former Ottoman Empire and comes from Persian مزه (mazze "taste, snack" < mazīdan "to taste"). In Turkey, meze often consist of beyaz peynir (literally "white cheese"), kavun (sliced ripe melon), acılı ezme (hot pepper paste often with walnuts), haydari (thick strained yogurt with herbs), patlıcan salatası (cold eggplant salad), beyin salatası (brain salad), kalamar tava (fried calamari or squid), midye dolma and midye tava (stuffed or fried mussels), enginar (artichokes), cacık (yogurt with cucumber and garlic), pilaki (foods cooked in a special sauce), dolma or sarma (rice-stuffed vine leaves or other stuffed vegetables, such as bell peppers), arnavut ciğeri (a liver dish, served cold), octopus salad, and çiğ köfte (raw meatballs with bulgur). In Greece, Cyprus and the Balkans, mezé, mezés, or mezédhes (plural) are small dishes, hot or cold, spicy or savory. Seafood dishes such as grilled octopus may be included, along with salads, sliced hard-boiled eggs, garlic bread, kalamata olives, fava beans, fried vegetables, melitzanosalata (eggplant salad), taramosalata, fried or grilled cheeses called saganaki, and sheep, goat, or cow cheeses. Mutabbal/Babaghanoush – eggplant (aubergine) mashed and mixed with seasonings. Falafel – a deep-fried ball or patty made from ground chickpeas, fava beans, or both. Tashi – Dip made from tahini, garlic, salt and lemon juice with chopped parsley garnish. Halloumi cheese, usually sliced and grilled or fried. Souvlaki – Bite sized meat cubes (lamb is very common), grilled on a skewer over charcoal. Stifado – Slow cooked beef stew with lots of onions, garlic, tomatoes, cinnamon, pepper and vinegar. Afelia – Diced pork marinated in wine with coriander seed, then stewed. Lountza – Smoked pork loin slice, usually grilled. Dolma Vegetables like peppers, eggplants or courgettes stuffed with rice, chopped mint, lemon juice, pepper, minced meat. Sarma (also known as Koubebkia, yaprak or Mashi Warqenab) – Grape vine leaves, stuffed with rice, chopped mint, lemon juice, pepper, minced lamb. Tzatziki – Dip made from plain yogurt, chopped cucumber with finely chopped garlic and mint leaf. Tarama – a fish roe dip based on cured carp fish roe, mashed potatoes and olive oil. In the traditional Istanbul variety of this dish, a substantial part of the roe must remain intact. Labneh – strained yogurt which tastes similar to cream or sour cream only more tart. In Syria, Lebanon and Cyprus, meze is often a meal in its own right. There are vegetarian, meat or fish mezes. Groups of dishes arrive at the table about 4 or 5 at a time (usually between five and ten groups). There is a set pattern to the dishes: typically olives, tahini, salad and yogurt will be followed by dishes with vegetables and eggs, then small meat or fish dishes alongside special accompaniments, and finally more substantial dishes such as whole fish or meat stews and grills. Establishments will offer their own specialities, but the pattern remains the same. Naturally the dishes served will reflect the seasons. For example, in late autumn, snails will be prominent. As so much food is offered, it is not expected that every dish be finished, but rather shared at will and served at ease. Eating a Cypriot meze is a social event. In the Balkans, meze is very similar to Mediterranean antipasti in the sense that cured cold-cuts, cheese and salads are dominant ingredients and that it typically doesn't include cooked meals. In Serbia, Croatia, Bosnia and Montenegro it includes hard or creamy cheeses, kajmak (clotted cream) or smetana cream, salami, ham and other forms of "suho/suvo meso" (cured pork or beef), kulen (paprika flavoured, cured sausage), cured bacon, ajvar, and various pastry; In Bosnia and Herzegovina, depending on religious food restrictions one obeys, meze excludes pork products and replaces them with sudžuk (dry, spicy sausage) and pastrami-like cured beef. In southern Croatia, Herzegovina and Montenegro more mediterranean forms of cured meat like pršut and panceta and regional products like olives are common. Albanian-style meze platters typically include prosciutto ham, salami and brined cheese, accompanied with roasted bell peppers (capsicum) or green olives marinated in olive oil with garlic. In Bulgaria, popular mezes are lukanka (a spicy sausage), soujouk (a dry and spicy sausage), sirene (a white brine cheese), and Shopska salad made with tomatoes, cucumbers, onion, roasted peppers and sirene. In Romania, mezelic means quick appetizer and includes Zacuscă, cheeses and salamis, often accompanied by Țuică. Meze is generally accompanied by the distilled drinks rakı, arak (Syria), ouzo, Aragh Sagi, rakia, mastika, or tsipouro. It may also be consumed with beer, wine and other alcoholic drinks. Cyprus Brandy (served neat) is a favourite drink to accompany meze in Cyprus, although lager or wine are popular with some. The same dishes, served without alcoholic drinks, are termed "muqabbilat" (starters) in Arabic. In Bulgaria, meze is served primarily at the consumption of wine, rakia and mastika, but also accompanying other alcoholic drinks that are not local to the region. In addition to traditional local foods, meze can include nuts, sweets or pre-packaged snacks. The term meze is generally applied to any foods and snacks consumed alongside an alcoholic beverage. In Greece, meze is served in restaurants called mezedopoleíon and tsipourádiko or ouzerí, a type of café that serves ouzo or tsipouro. A tavérna (tavern) or estiatório (restaurant) offer a mezé as an orektikó (appetiser). Many restaurants offer their house poikilía ("variety")—a platter with a smorgasbord of mezédhes that can be served immediately to customers looking for a quick or light meal. Hosts commonly serve mezédhes to their guests at informal or impromptu get-togethers, as they are easy to prepare on short notice. Krasomezédhes (literally "wine-meze") is a meze that goes well with wine; ouzomezédhes are meze that goes with ouzo. ^ Davidson, Alan (21 August 2014). The Oxford Companion to Food. Oxford University Press. pp. 517–518. ISBN 9780191040726 – via Google Books. Wright, Clifford A. (2001). Mediterranean vegetables: a cook's ABC of vegetables and their preparation in Spain, France, Italy, Greece, Turkey, the Middle East, and north Africa with more than 200 authentic recipes for the home cook (Illustrated ed.). Harvard Common Press. ISBN 9781558321960. Wikimedia Commons has media related to Meze.